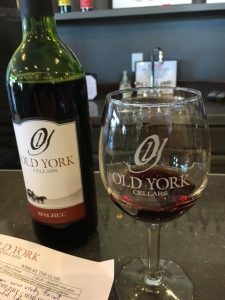 In my continuing quest to visit and support New Jersey wineries and the state’s wine industry, I recently visited Old York Cellars in Ringoes. Old York is a small winery – only about 3,600 cases a year, which in Napa would be the rough equivalent of a “garage” winery. Previously it operated as Amwell Valley Vineyard, which was first planted in 1978 but closed in 2005 and reopened under its new name in 2010. An interesting thing I’ve noticed about some New Jersey wineries again reared its head when I saw the wine menu, and counted 1, 2, 3…16 wines, including a “Port” made from Marechal Foch, a white “Port” made from the virtually-unknown Vignoles (also known as Ravat 51), two fruit wines, a white and a red proprietary wine, and even a sparkling Blanc de Blanc from 100% Chardonnay. I never fail to marvel at the effort that goes into so many offerings, and I feel that many Jersey wineries probably stretch themselves too thin this way. But I understand it, given how tough the Jersey wine market is, and the feeling that they have to offer so many wines to meet the varied tastes of potential customers. Like many other Jersey wineries, Old York also offers a lot of additional draws such as wine and music festivals, comedy nights, wine and painting, festivals, art shows and more. However, I just showed up on a remarkably warm and sunny February Sunday for an “ordinary” tasting, and found the winery packed with cars parked alongside the gravel access road, with a small parking lot at the end where the winery and tasting rooms are. A popular place! Walking into the small-ish but nicely-appointed tasting room, I was met at a “lecturn” by a lady selling what looked like raffle tickets, or to you Jerseyites who’ve even been to a kids’ sporting event, 50-50s. In fact you get six tickets, good to taste six wines, for ten bucks, including a tasting glass with their logo, which you get to keep. All in all, not bad, while different from most wineries where you just belly up to the bar and pay while you quaff. You can also get “chocolate pairings” for seven bucks more, with four little boxes containing one milk chocolate and three strengths of dark chocolate, and they suggest the pairings for each on the wine menu. 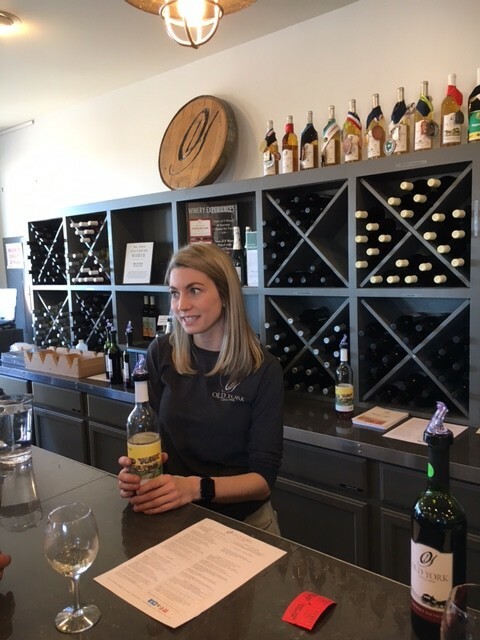 The tasting room itself is cozy, with hardwood floors and a wall of doors opening onto a lovely stone patio overlooking the vineyard that was as packed as the parking. And if you want to host an event, Old York has an 1100 square-foot “Vista” room, nicely appointed and also looking out onto the vineyard. I took my time tasting and the staff was very accommodating and didn’t try to rush me, which was very much appreciated…and not always the case in tasting rooms, where they sometimes try to move you along. And I had a very pleasant conversation with a lovely couple from Hillsborough, and with the lovely Molly, shown at right. Dry Riesling 2013: Definitely dry, more citrus-y than a classic Riesling and a nice but very faint nose. My least favorite. Vidal Blanc 2014: Fine example of this North American grape that does well in cold climates and mimics the best of Sauvignon Blanc. A very nice, bracing white. What Exit White (NV): Softer than the Vidal, made from Chenin Blanc and Cayuga White. Very enjoyable. Merlot (NV but made with 2013 and 2014 grapes): Fruity and fresh, with a hint of sweetness. Easy drinking red. Cabernet Sauvignon 2015: Very restrained nose, and uncharacteristically light-bodied. What Exit Red – A kitchen sink of Cabernet, Syrah, Marechal Foch and Landot Noir, in proportions that no one behind the bar seemed to know. But a tasty, hearty wine with a long and satisfying finish..and a unique blend I would think. Very nice! I also purchased a bottle of the Blanc de Blanc sparkling wine for $35, which I’m eager to try soon and will report back. I’m looking forward to being surprised at how good it might be. Anyway, all in all a very nice experience: quality if not exceptional wines, a lovely setting and very friendly hosts. I heartily recommend a visit!